Ooh, two posts in a day. Aren’t you the lucky ones? Check out what I’ve been slurping for my complexion in Umami Mart: Slightly Peckish and don’t judge me. In bookish news, I’m currently ensconced in Eowyn Ivey’s beautiful The Snow Child for my book group. I’m normally put off by a lot of hype but since reading Hilary Mantel’s Wolf Hall and Madeline Miller’s The Song of Achilles, I feel chastised and am prepared to believe. Kay Nielsen’s Stunning 1914 Scandinavian Fairy Tale Illustrations from Brain Pickings. 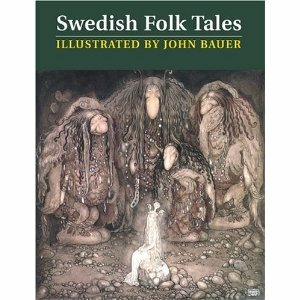 We used to own a book of Swedish Folk Tales illustrated by John Bauer. So beautiful and enchanting. And have you seen The Lizzie Bennet Diaries? Thank you Simon T, Ana and Iris! It’s Pride and Prejudice‘s 200th birthday this week. My favourite adaptations are still the black and white film starring Lawrence Olivier and Greer Garson which I first saw when I was 14 and, of course, Colin Firth’s Darcy. Still swooning. yep, I read P&P when I was 14 and saw the Greer Garson/Laurence Olivier version that year too. It’s not cool these days to like it, but you know what? I don’t care. I like it too – and the Jennifer Ehle/Colin Firth one. Both great. Hurray! I don’t care if it isn’t cool either. It’s probably the version I’ve seen most as well – I was addicted to it as a teenager. But I really loved Jennifer Ehle as Lizzie though. I do too and am peeved that no one ever mentions her. It’s all Firth, and he was great, but so was she.